Ergonomic task chair with height adjustable arms (2 1/2 inches) to maintain 90 degree elbow angle. Upholstered in choice of 18 standard colors. Designed to encourage proper body placement, which reduces stress on back, neck and shoulders. 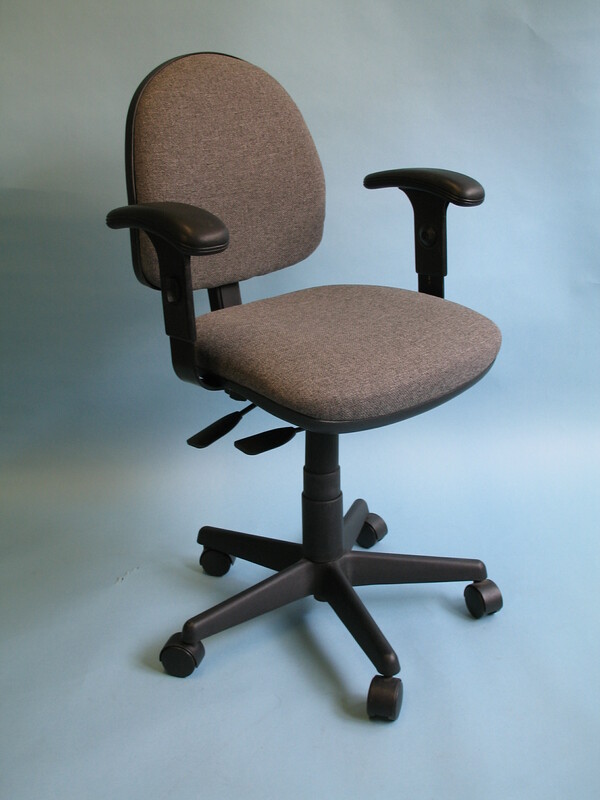 Asynchronous control allows independent adjustment of back and seat angles. Positions the hips to provide proper lumbar curvature. Compound curve in the oversized seat keeps the occupant positioned against the backrest and prevents pressure on the pelvis. Waterfall seat eliminates pressure on the back of the thighs. Pneumatic height adjustment from 17 1/2" to 23". Range of motion: Seat: 7o forward, 5o backward. Back: 5o forward, 20o backward, 4" elevation. Dimensions: Seat: 19"W x 17 1/2"D. Back: 16"W x 16"H. Composite Base: 25" Diameter. Height adjustable arms to maintain 90o elbow angle.